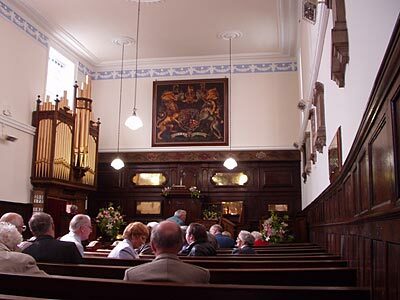 Photograph taken facing the pulpit end of the chapel, taken on 27 April 2003 on the occasion of the commemorative service after the restoration and redecoration of the chapel. The coat of arms of George I, painted by Richard Chandless of Shrewsbury, hangs on the wall above the pulpit. To return to the Unitarian chapel's main page, click here.